Most people blow their money in Las Vegas on the casino floor, but there's no rule that you have to give all your cash over to the slot machines. So if you have no intention of paying your mortgage this month (or this year), check out these kinda phenomenally cool ways to burn through your bank account in Sin City. OK, so you have a large party and you need a few rooms. The Artisan is a small boutique hotel just off the Strip with 65 rooms, an artsy lounge in the lobby, and a swimming pool where tops are optional. We call that "European-style," here in Vegas. 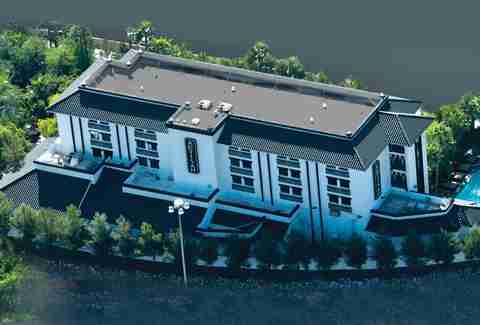 You can also rent the entire property -- starting at $7,500 a night. The price may go up a bit on weekends and other busy days, but the idea is a huge hit. On average, people rent the whole thing two to three times a month -- for everything from corporate events to weddings and birthdays. 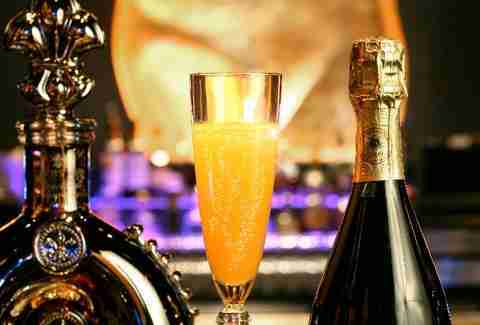 The Artisan will even throw in some basic catering with the option to add on an open bar and other cool perks. Maverick Helicopters will fly you to the Valley of Fire State Park -- just to test your flexibility among the spectacular views and historic red rock formations. It's called heli-yoga, and takes place in an area that can only be reached by helicopter -- so you and your class will pretty much have the spot all to yourselves. Upon arrival, you'll be handed a mat, water, and LED headset to hear the music and your instructor's voice. After the 75-minute session wraps up, you'll get some extra time for a champagne toast and to check out the scenery. Your chopper will then bring you back to Vegas, taking the scenic route over the Strip and downtown. The entire excursion is more than two hours. 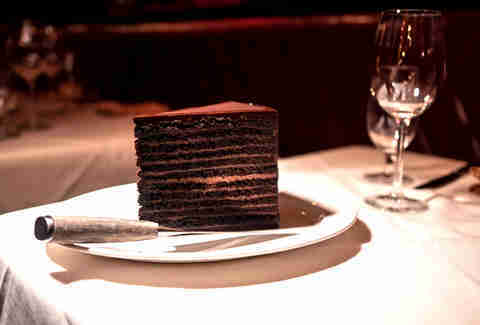 Strip House is one of our favorite steakhouses on the Strip, and it's also famous for its 24-layer chocolate cake. The 8in round dessert is powerfully rich, with each layer alternating between chocolate cake and creamy chocolate filling, and topped with French semisweet chocolate ganache. Take one home or have it shipped frozen for $120 -- that's about five bucks per layer, if you're keeping track. Each cake serves eight to 10 people. You may want to browse The Atrium the next time you visit the Palazzo. The newly opened shopping destination is kind of like a sprawling department store for people who have too much money and really like fun. It also comes with its own bar in the back -- for both cocktails and hand-rolled cigars made on the spot. 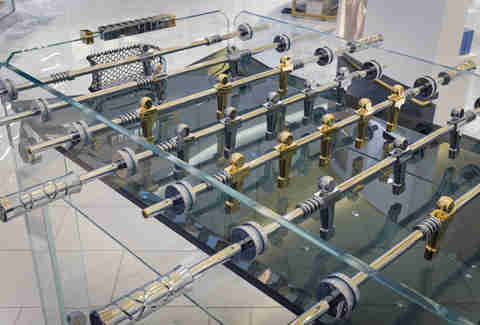 Among the items for sale are jewelry, rare spirits, and a foosball table made with 24-karat gold-plated pieces. The Cristallino GOLD LE has a price tag of $25,000; each one is part of a limited series and numbered. Even the nets are handcrafted… which is probably as it should be, at that price. The Bellagio fountain shows are not only incredibly popular, but they're also free to watch. However, you can control the show yourself if you happen to have an extra $250,000 to spend. You'll be given a prime seat at Hyde Bellagio and after the fountains have finished their last official show for the evening, a gold box will be delivered to your table, along with a menu of songs to choose from. The box contains a single red button. Press it once to set off 4,700 lights and 1,200 individual fountains shooting up to 460ft in the air and spanning 1,000ft across the lake -- while your song plays over speakers loud enough to be heard out on Las Vegas Blvd. 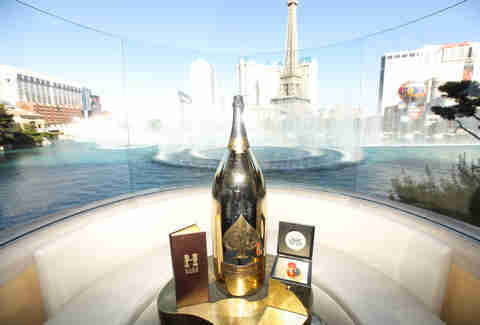 You'll also get a massive 30-liter bottle of Ace of Spades Champagne -- equal to about 40 regular bottles -- to make a toast and enjoy the moment. Quality steaks are regularly dry-aged for about 30 to 40 days, but Carnevino at the Palazzo exceeds those standards with cuts aged 90 to 120 days. 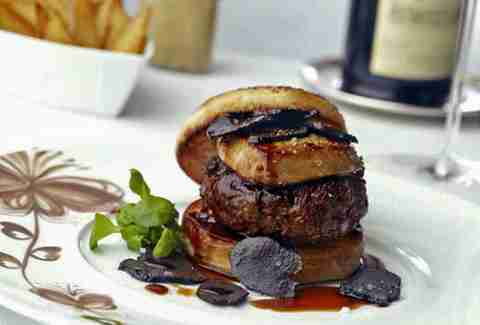 If that's not enough, there's also the off-menu riserva steak that's aged seven to eight months. It requires a special cut that will survive the process, and is served in 1-3in portions -- for up to $240. It has a powerful taste and isn't always available, so if you're interested, it's a good idea to call in advance. 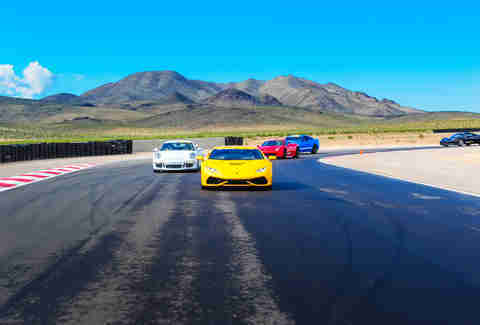 SPEEDVEGAS offers a chance to get behind the wheel of an exotic car -- like a Lamborghini, Ferrari, or Corvette -- and take a spin around a track that's 1.5 miles long and full of twists and turns. But why race against strangers, when you can have the track all to yourself and your buddies for $12,000? It's 60 minutes of unlimited driving and available once a day from 8:30-10am. You can also add coffee and breakfast -- because racing is better on caffeine. Head to the Cosmopolitan, where Beauty & Essex has launched a $2,000 dinner package. 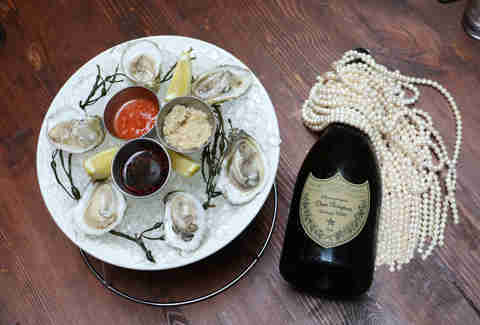 The restaurant, lounge, and pawn shop all rolled up in one is offering a seven-course dinner that begins with oysters and a bottle of Dom Perignon... served alongside a pearl necklace. The rest of the dinner while be a series of plates -- shared among four people -- that includes tuna poke wonton tacos, basil pesto ravioli, thick-cut filet, donuts for dessert, and much more. How much would you pay for a good drink? XS Nightclub at the Wynn Encore has a $10,000 cocktail called the Ono... and you thought bottle service was expensive. The cocktail is made with Charles Heidsieck Champagne (Charlie 1981) and Louis XIII de Remy Martin Black Pearl cognac. It's served alongside a pair of men's silver cufflinks and a women's 18-karat white gold chain with a black pearl pendant. 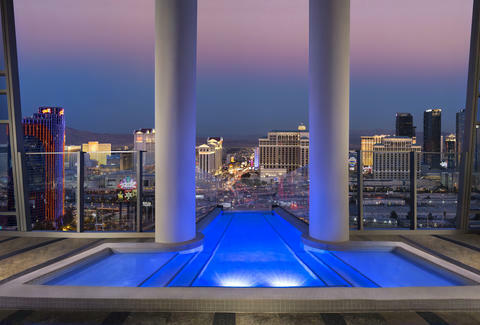 There's no shortage of extravagant hotel suites in Las Vegas, but the ones at the Palms may be the most fun and indulgent. The Luxe Collection Fantasy Suites include the two-story Sky Villa -- with its own glass elevator, sauna, and glass-enclosed pool that hangs over the edge of the tower with a sky-high view. It runs from $20,000 to $35,000 a night. 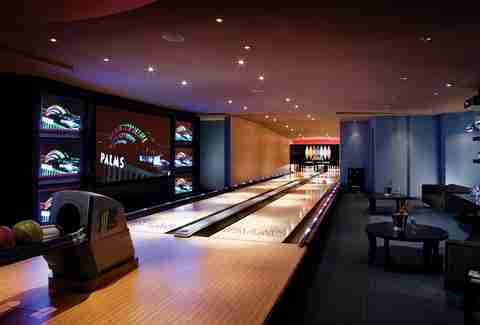 The Hardwood Suite, on the other hand, is $25,000 and comes with an indoor basketball court, scoreboard, and locker room, while the Kingpin Suite has two full-sized bowling lanes, and will set you back a relatively reasonable $7,500 to $15,000. Still too much? The Real World Suite was used by the cast of MTV's Real World back in 2002. It comes with a price tag of $5,000 to $10,000, and even includes the "confessional" room -- so you can confess all the sins you're committing in Las Vegas, or just complain about your roommate's snoring habit. A night at Bazaar Meat at the SLS doesn't usually come cheap. Multi-course tasting menus can run up to $170 per person, and that's not counting drinks. 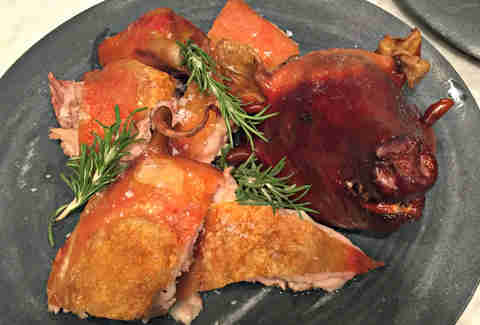 You can also splurge on a suckling pig that's roasted in a wood-fired oven for a crisp skin on the outside and plenty of juicy meat on the inside. Each pig is 9-11lbs and your table can nibble on the whole thing for $520. A quarter serving is $140. 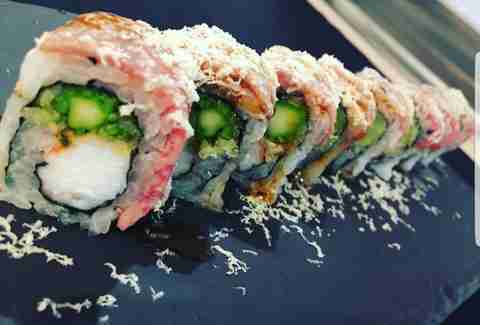 Sushi Roku is the home of the High Roller Roll -- a brace of two rolls -- for $250. (You may have already seen the kinda amazing video). The first roll features tempura lobster topped with Spanish bluefin toro and high-end caviar, while the other one has seared Japanese wagyu and shaved truffles. Both are sprinkled with gold flakes on the same plate. Want something less expensive yet still indulgent? Sake Rok has a good alternative, the High Steaks Roll (yes, that's how it's spelled) is made with king crab and tempura asparagus and topped with A5 wagyu, truffle ponzu demi-glace, and shaved foie gras butter... for a mere $50. 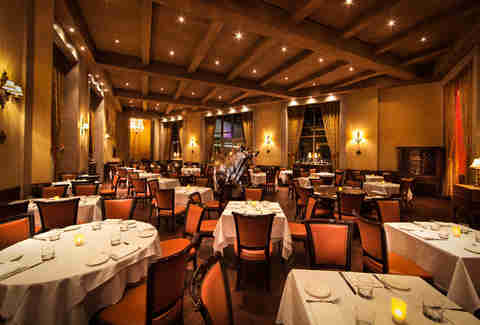 Delmonico Steakhouse stands apart from other restaurants with one of the best spirits collections in the country. So why not create your own flight of ultra-rare whiskey? 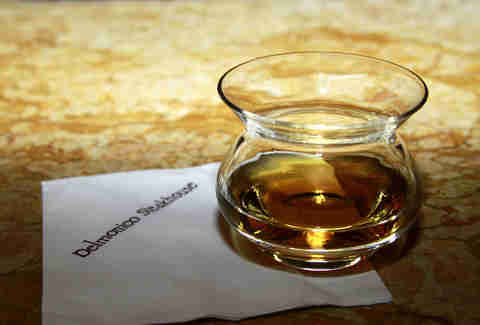 We suggest Macallan M for $750, Chivas 62 Gun Royal Salute for $535, and Highland Park 30-year for $232. Each pour is just 1.5oz, so savor every sip. There is also a very deep wine list to complement your juicy red steak. From the Bordeaux selection, order the 1961 Chateau Latour (Pauillac) for $13,625. If you think an entire bottle is too much, the 2008 cabernet blend from Mastery Napa Valley is available for $45 a glass. Lavo is going big with the Party Brunch sundae on weekends. 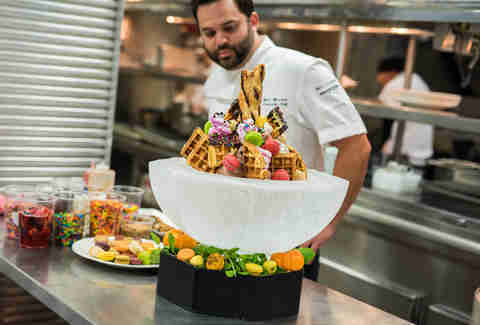 The massive dessert is served with 18 scoops of ice cream, fresh macaroons, waffles, marshmallow, whipped cream, chocolate sauce, and sprinkles inside a giant ice bowl. It's delivered with a rowdy tableside presentation -- with Avion espresso liqueur poured on top -- for $800. Rob Kachelriess is a former television news producer who has been writing about Las Vegas on Thrillist for more than three years. He was managing editor for Vegas2LA Magazine and his work has recently appeared in Vegas Seven and Vegas Magazine. He is taking a close look at his 401K right now. Follow him on Twitter @rkachelriess.